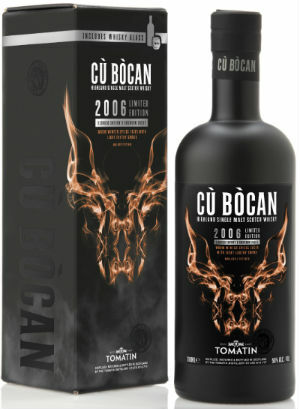 Since the introduction of the peated Tomatin Cù Bòcan series back in 2013, several different expressions and vintages have been released, from NAS and mid-noughties vintages all the way though to distillates from the late 1980s. 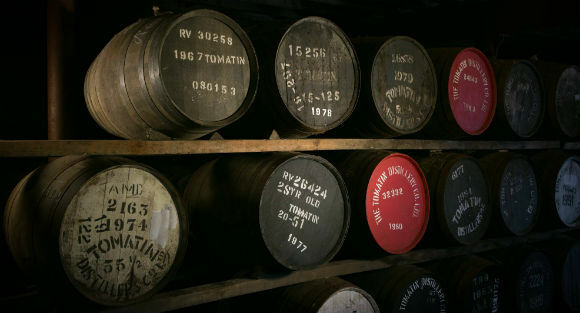 The most recent release is a 10 year old, consisting of whisky distilled in 2006. 50% seems to be a magic number with this whisky; the final cask make up is 50% 1st fill ex-bourbon barrels and 50% 1st fill ex-oloroso sherry butts, with the final liquid being bottled at 50% ABV. With all those first fills combined with a whack of smoke and a slightly-higher-than-normal strength, this is shaping up to be a flavour-laden dram. It’s limited to 9000 bottles and will be available globally, except the USA [insert any number of jokes about Donald Trump here]. Nose: Overdone crème brûlée, lemon sponge cake and heavily toasted almonds to start. Then there’s a maltiness, some bread dough, heathery smoke and crackling kindling. Palate: A big spiciness to begin; root ginger, clove and nutmeg really give this a tingling start – akin to the tingle from heavily flavoured salt and vinegar crisps. This is followed by charred marshmallows on a stick, custard creams and dry woodsmoke. Finish: Sweet smoke (flavoured pipe tobacco?) with the faintest hint of car tyres and leather. Overall: Big and bold. But then again, the Cù Bòcans I’ve tried always have been. The initial spicy hit on the palate is maybe a bit much and this is where the youngish spirit shows its age. Having said that, the rounded smoke and the hints of leather and sweet tobacco on the finish give this a pleasing send off. Another solid addition to the Cù Bòcan range. This entry was posted	on Saturday, October 7th, 2017 at 11:30 am	and is filed under Reviews. You can follow any responses to this entry through the RSS 2.0 feed. Responses are currently closed, but you can trackback from your own site.